1. 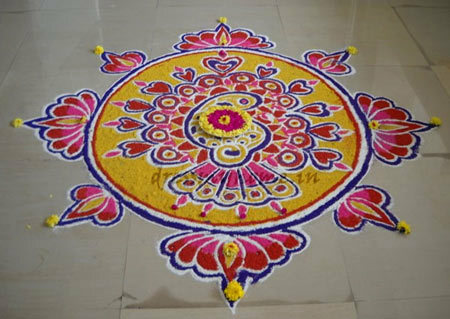 A beautiful and colourful Rangoli for all of you to begin with. 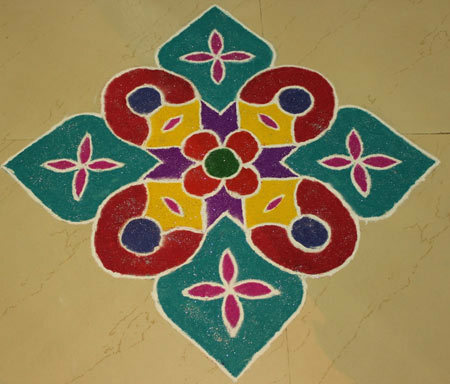 This beautiful rangoli design is done with vibrant colours. 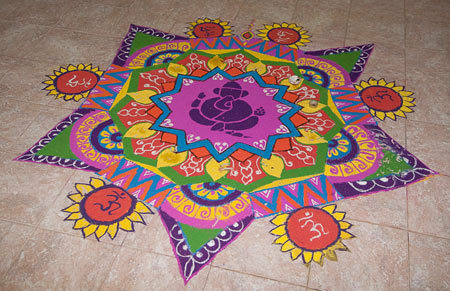 In the center, Lord Ganesha’s design is done and he is surrounded by holy – ‘Om’. This design can easily be done on occasions like ‘Ganesha Chaturthi’ as well as for Diwali and Holi. The design will surely get you lots of compliments. You can also add some diyas to add to the design. This is a perfect free hand rangoli designs ever. 2. ‘Peacocks’ have been a great source of inspiration for many Indian artists. Here’s another example of that inspiration with a peacock rangoli design featuring a Peacock done in the middle of this freehand Rangoli. The outer border is decorated with floral patterns. 3. This use of colours in this design is quite unique. A bright sky blue shade is used for the base. The star pattern in the middle is unique too and contrasting colours have been used. The lotus design done around the star pattern looks very beautiful. 4. 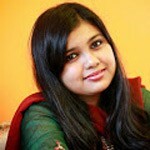 A short and sweet rangoli design of the freehand rangoli designs for you freehand artists. 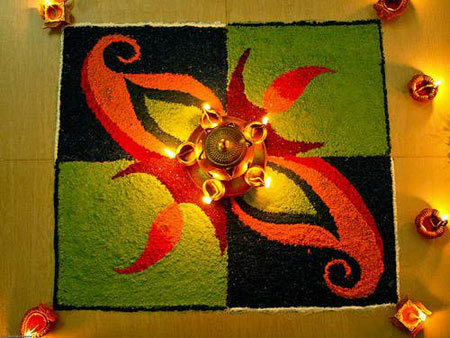 We love the use of diyas to enhance the beauty of the Rangoli. This one is small enough to be done at any place and in any small area. 5. Another unique and simple free hand Rangoli designs for you to try. This one uses very minimal colours, so it’s easy to do and the chances of mistakes are very less. The inclusion of diyas makes it even more appealing. The colours used are also quite different as green and purple has been used in this design rather than the common red, yellow, saffron etc. 6. 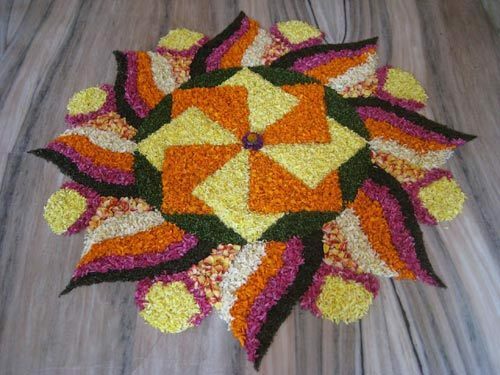 This one is a flower Rangoli for you all freehand rangoli makers. We love the variation of colours and the floral pattern in the middle. 7. 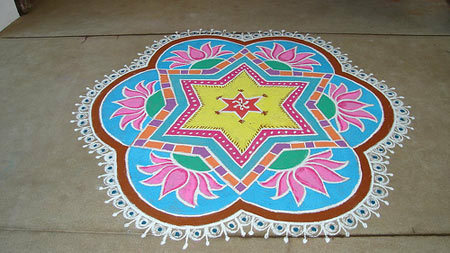 This beautiful and colourful design is for those who love small rangoli designs for their homes. We love how this design is small enough to be done at any corner of the house or even at the entrance. 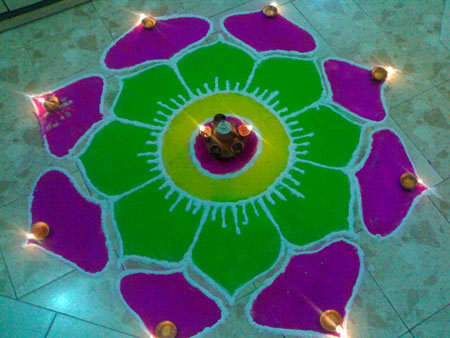 The use of colours is also nice with green, red, yellow, violet and white being used to make this rangoli. 8. This one is a bit tough to do and we can see a hexagon shape being used rather than common patterns like square, octagon or circular shape. The colours used are quite bright and catch attention easily. Bright pink, purple, orange and white colours have been used. There are many small details in this design calling for special expertise in this art. 9. This design is inspired by peacocks – the national bird of India and we see a pair of peacocks done in the centre of the Rangoli. 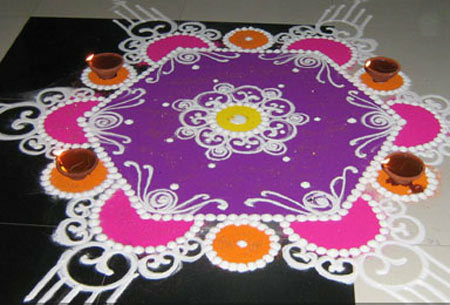 The colours used are quite vibrant and make this a colorful rangoli design for all of you to try. 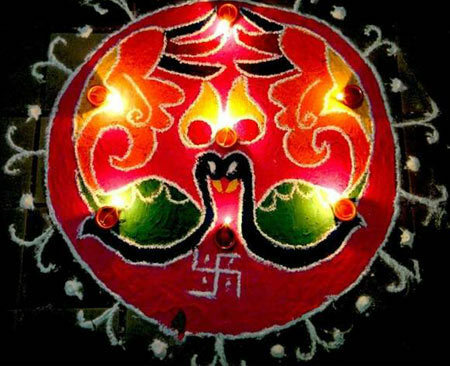 The diyas used make it even more beautiful and appealing. 10. 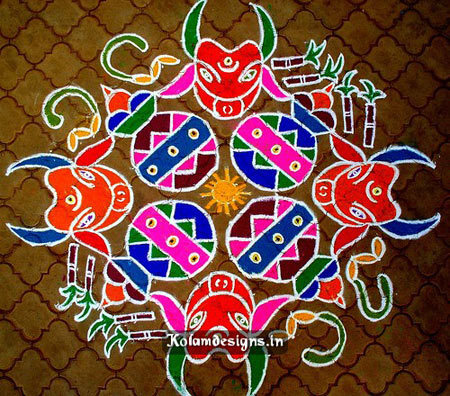 This one is Rangoli design for the festival of Kolam. This design is quite complicated with very fine and minute details. The colours are quite vibrant making this a great choice for anyone to try. 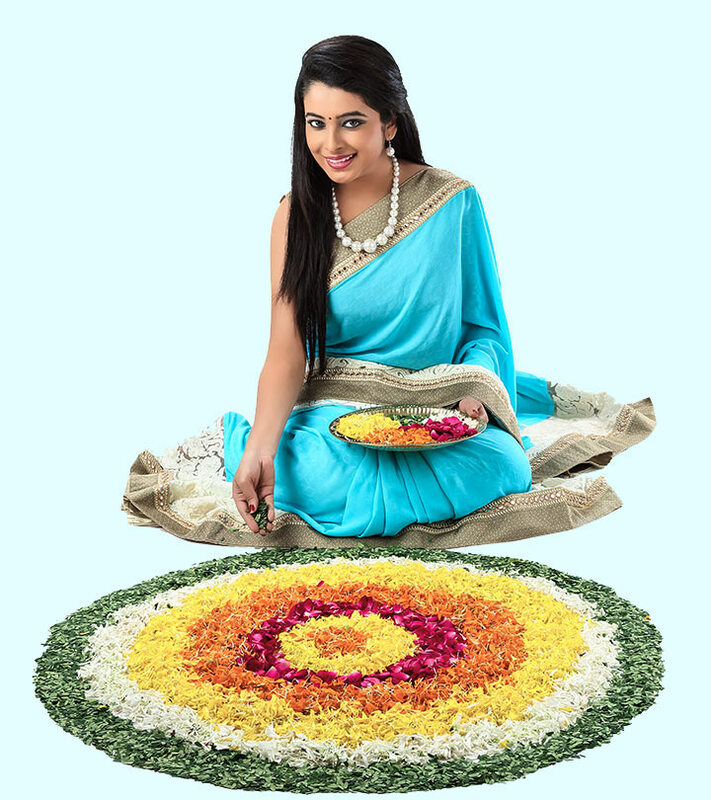 So these are our top 10 freehand Rangoli designs latest on the list. Which is your favourite among these?